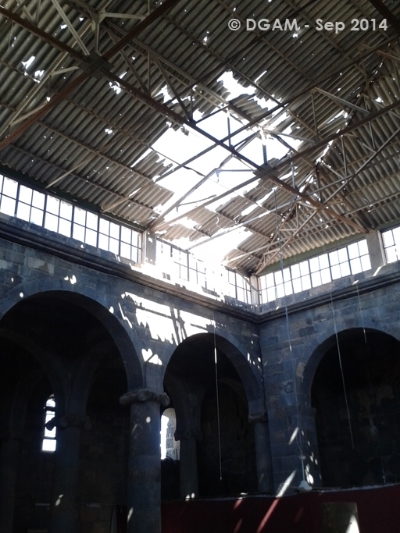 The DGAM has posted a second update on damage to the UNESCO World Heritage Site in Bosra. This update focuses on the Mabrak Mosque, the al-Omari Mosque, and the al-Hawa Bab. Pictures found can be found here. View of damaged sites around the Citadel of Aleppo can be found here, from the Council of Free Aleppo Governorate – Archaeology Department. It appears that Khosrofia/Khosrowiyya School in Aleppo has experienced total destruction. See the Aleppo Archaeology photo here. Temple of Haddad (Storm god) in Aleppo Citadel, Aleppo has been damaged, in photograph posted by Aleppo Archaeology here. Protect Syrian Archaeology has shared a video (Shahba Press) of the Great Umayyad Mosque of Aleppo. The video showing a fire in the Mosque can be found here. The DGAM has posted a damage assessment for archaeological sites and buildings from July to September 2014, and indicates further assessments are ongoing, here. The data table itself is found here, and offers a comprehensive view of the types and extent of damage throughout the country. The DGAM reports on 11 October 2014 that the authorities have recovered a Roman-era mosaic and part of a marble statue from Hama out of concern for its protection. The brief is posted here. Erin Thompson argues that the US needs to stop the illegal imports of antiquities, in “Restrict Imports of Antiquities from Syria to Cut Down on Looting“. The DGAM (September 30 2014) reports that members of IS Militia are hiding in the ruins of Dura Europos to escape bombing by Coalition aircraft. Dura, which has already been heavily looted during the Syrian Civil War, is in the area currently under IS control in eastern Syria. See the report here. The DGAM reports on a ‘royal crypt’ discovered in Latakia, but does not give any indication of dating. A description can be found here. Several meetings from 6-9 October in Berlin occurred in conjunction with the Free University of Berlin and German archaeologists with DGAM. Topics included training DGAM staff, assistance in ending the illegal antiquities trade, and sharing of information. Read the full report here. The New York Times ran an op-ed by Abdalrazzaq Moaz (9 October 2014) that “Only an End to the Civil War in Syria Will Solve the Problem” that is, of the looting and destruction of Syria’s heritage. Moaz, former Syrian deputy minister of culture and director general of Antiquities and Museums, is now a visiting professor at Indiana University and also involved with ASOR’s Syrian Heritage Initiative. Huffington Post (from the Jerusalem Post) posted ‘UNESCO Makes a Stand on “cultural cleansing” ‘ (6 October 2014) with a focus on the need to protect the Jewish heritage in Syria and Iraq. The article also covers UNESCO’s comprehensive attempts to crack down on the illegal antiquities trade. The Guardian (7 October 2014) calls for greater international protection of the shared architectural heritage of humanity. Several well-known examples from Syria are discussed, together with those from Afghanistan and Iraq. The ‘Cultural Heritage Lawyer’ Rick St. Hilaire discusses on his blog the sharp rise in imports into the USA of cultural artefacts material from the Middle East between 2011 and 2013 and comments on its implications. See the post here (6 October 2014). The New York Times ran “Antiquities Lost, Casualties of War” (3 October 2014), providing an overview of damage in Syria and Iraq but also exploring the use of heritage as propaganda, quoting Michael Danti of Boston University that “ISIS uses heritage explicitly, tying it into history, providing a back story for itself and showing it is part of this massive unstoppable force to appeal to young fighters.” The article also discusses tactics of intimidation and murder directed by IS towards members of the antiquities authorities, such as the DGAM. Conflict Antiquities observes that the C.A. report of the destruction of the Armenian Church in Deir Ez-Zor by IS, covered via the @conflictantiq Twitter feed, had been appropriated by IS or IS supporters, to claim that actually the US-led coalition was responsible for the damage. This is another example of how the cultural heritage of Iraq and Syria are being used as a propaganda weapon. See the documentation of the issue here.